Alex Wong/Getty ImagesUS Secretary of Homeland Security Kirstjen Nielsen. Secretary of Homeland Security Kirstjen Nielsen faced an onslaught of questions at the White House amid growing criticism over the department’s enforcement of a “zero-tolerance” policy targeting migrant children and their families who cross the US-Mexico border illegally. Homeland Security secretary Kirstjen Nielsen faced an onslaught of questions at the White House amid growing criticism over the department’s enforcement of a “zero-tolerance” policy – criminally prosecuting migrants who cross the US-Mexico border and separating them from their children. “How is this not specifically child abuse for these innocent children who are indeed being separated from their parents,” CNN White House correspondent Jeff Zeleny asked, referring to children who were separated from their parents and held in detention centres. Nielsen answered by calling the US a “country of compassion” and then pointed out the 10,000 of the 12,000 children in care of Health and Human Services who she said had arrived to the US as unaccompanied minors. But Zeleny continued to press Nielsen on whether it’s considered child abuse that the government has separated some 2,000-plus children from their families at the border. Nielsen never directly answered that question. Customs and Border Protection’s Rio Grande Valley Sector via Associated PressIn this photo provided by U.S. Customs and Border Protection, people who’ve been taken into custody related to cases of illegal entry into the United States, rest in one of the cages at a facility in McAllen, Texas, Sunday, June 17, 2018. Nielsen and the White House continued to face public backlash after offering what appeared to be conflicting statements on the “zero tolerance” policy. Despite Nielsen saying on Twitter that DHS did “not have a policy of separating families at the border,” Attorney General Jeff Sessions explicitly endorsed the policy in May. 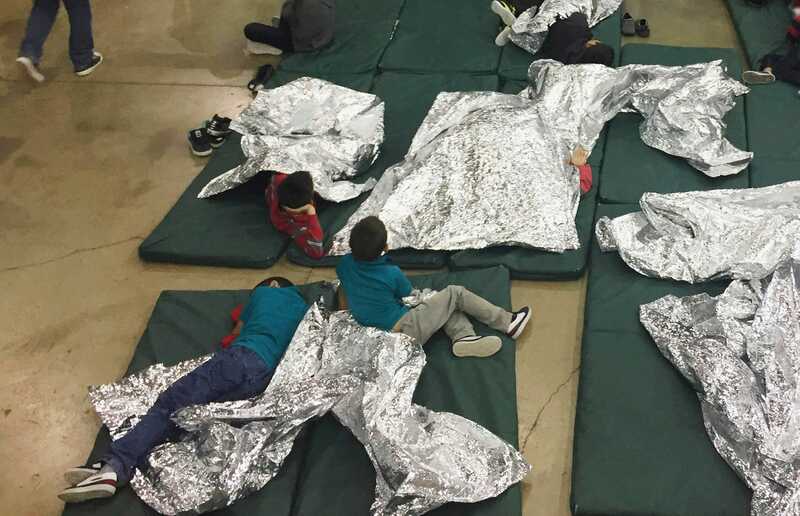 During the Obama administration, undocumented migrant families that were apprehended were detained together under Immigration and Customs Enforcement (ICE) custody.